Anyway, without further ado, I bring you my game of the month. Its a relatively new one, it got released earlier this year, or 2008 in Japan. I was gonna do another DS rpg, but I've not really played any of them to death quite as much as this one. Its addictive, simple fun, with a ridiculous amount to do for your money. The main Pokemon games are one franchise I don't really mind paying full price for. I mean, to illustrate my point, I've got over 140 hours on my Platinum save, and I'm still not even quarter through the pokedex (roughly). My Diamond save has a stupid amount of time on it-over 390 hours of play time. Thankfully I've completed the pokedex and done almost everything in it. For those who don't know, the Pokemon games haven't really changed much since Red and Blue first came out a few years ago, but the addictive, simple team based monster-collecting rpg style game was always a very popular formula, so why change it? In my opinion, they have always improved them. Sure, they wont be for everyone, and the graphics and story aren't amazing, but I see a lot of good points for the Pokemon games on the DS. The games have wi-fi play now, which is a great improvement on the last generation of games on the GBA-Ruby, Sapphire, Emerald, Fire Red and Leaf Green. The wifi in Diamond, Pearl and Platinum allows you to battle friends (you have to exchange the rather clunky friend codes first) and trade with others as well. There is an option in the GTS building to trade with people you dont know (and whose friend codes you dont need) but you can only get pokemon that are already on your pokedex ie. you've seen them or something. 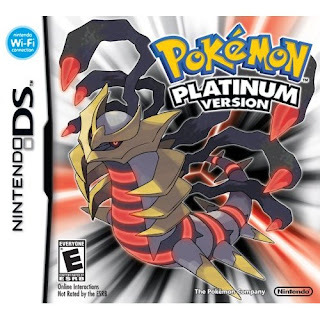 Now, with remakes of the Game Boy colour games Pokemon Gold and Silver on the way (HeartGold and SoulSilver), its the perfect time to dig your DS games back out, or pick one up if you dont have any. Catch some pokemon, or transfer them from your GBA games to your DS ones with Pal Park and have some fun! Oh, and if you have the game, and can get on wifi, you can download an event item, which before Platinum, you couldnt do. You could only really get the mystery gift type things from events if you actually went to them. You can get Oak's Letter between the 28th September and 8th November, which has something to do with catching Shaymin, I believe. I havent read much on it yet. See the official site for more news on that. I'd recommend the game to people who like simple, addictive and fun games, and if you like the kinda game where there is lots to collect (little monsters in this case) then even better, I'm sure you'd love the game. There is a lot of depth to the Pokemon games as well, if you read around the web. There are lots of hidden values and indicators which people have discovered from picking the games apart and playing them to death. The good thing is, not everyone needs to delve that deep if they dont want to.